Time spent: 24 hrs. We officially began our count at 8:11 a.m. on 10 May and ended at 8:11 a.m. on 11 May. Beane, Corey, and Davis participated for the entire 24 hours; Finnegan and Horton participated for about the first 8-9 hours and rejoined us for about the last 2 hours. Area covered: Our search included portions of Bladen, Brunswick, Columbus, Hoke, Moore, New Hanover, Pender, Richmond, Robeson, and Scotland counties, NC. We began at 1208 Canal Drive (ca. 1.0 airmi. NNE Carolina Beach) in New Hanover County and ended on the Sandhills Game Lands (ca. 5.2 airmi. NW of Marston) in Richmond County. Weather: Mostly sunny to partly cloudy with a high temperature around 90F and lows in the low 60sF. Techniques: Most species were observed via visual and auditory searches, while walking and driving. Binoculars and a spotting scope were used to assist in viewing many species. Several species were taken in dipnets, a 12-ft. seine, and minnow traps; and several were found by turning natural and artificial surface cover. Several species were observed only as road-kills or otherwise dead specimens; these are noted by an asterisk (*). Tuesday, 8:11 a.m. For the 10th consecutive year, we kicked off our event with Eastern Glass Lizards (two were found) at Carolina Beach. Tuesday, 8:22 a.m. The count gets underway, checking minnow traps and scoping birds along the inlet off the dock across from Bob’s beach house. Tuesday, 8:24 a.m. Laughing Gulls were among the most abundant bird species on this year’s Wildathon. Tuesday, 8:46-8:49 a.m. The first snakes to make the list were the Southeastern Crowned Snake and Red-bellied Snake—two of NC’s tiniest snake species. Neither is particularly easy to find, but this year we were lucky enough to see four crowned snakes and two redbellies. Tuesday, 9:20 a.m. A Black Racer checks in—the first of six we would see during the 24 hours. Tuesday, 9:40 a.m. A species we don’t often get on Wildathons, this Solitary Sandpiper at Lily Pond was a good find. Tuesday, 9:43 a.m. The Chicken Turtle is an oddball creature in many ways. Uncommon in NC, it is seldom seen—let alone seen basking. But this was a very lucky Wildathon. Tuesday, 10:29 a.m. A Longnose Gar at the Carolina Beach marina. Tuesday, 10:44 a.m. Painted Buntings were common on this year’s Wildathon. I unfortunately did not have time for photos of the strikingly colorful males. 15 or so shorebird species we saw there. Tuesday, 1:06 p.m. A few Least Sandpipers were in the mix. Tuesday, 1:28 p.m. Royal and Sandwich were among the six tern species we saw at Ft. Fisher. Tuesday, 1:38 p.m. Ed and Bob were about to go ‘n’ seine. Tuesday, 1:57 p.m. By far the highlight of this year’s Wildathon was the sighting of several Leatherbacks—one from the Kure Beach pier and several off the beach at Ft. Fisher. A very unique species, the Leatherback is the most massive reptile in the world, occasionally weighing over a ton. Many of them were passing through the area to feed on cannonball jellyfish. This spectacular sea turtle was a lifer for everyone on the team. Tuesday, 2:10 p.m. Gull-billed Terns at Ft. Fisher. Not always an easy species to see in NC. Tuesday, 3:40 p.m. A Snowy Egret at the Ft. Fisher ferry dock. Tuesday, 4:12 p.m. On the Ft. Fisher-Southport Ferry. Tuesday, 6:34 p.m. “Snakes hang thick from the cypress trees, like sausages on a smokehouse wall.” Brown Water Snakes were our most numerous snake species this year; this lady at White Marsh had several eager suitors. several off the beach at Ft. Fisher. A very unique species, the Leatherback is the most massive reptile in the world, occasionally weighing over a ton. Many of them were passing through the area to feed on cannonball jellyfish. This spectacular sea turtle was a lifer for everyone on the team. We counted only those species which we could positively identify to the agreement of our team. We recorded several species not found on any of our previous Wildathons. Leatherback and Spinycheek Sleeper were lifer species for everyone on the team. We omitted from the list a few species that we were uncertain of. Our total species count was the fourth-highest of the 24-hour Dream Team’s 17 Wildathons to date (our record was 248, in 2014). Our bird list was our second-best ever. For the 10th straight year, it was a pleasure to begin the event with two Ophisaurus ventralis at Carolina Beach in New Hanover County, in the backyard of the former home of the late Ms. Myrtle Curry, mother of team member Bob Davis. The last species recorded was Sceloporus undulatus, on Sandhills Game Lands in Richmond County with less than 30 seconds remaining. Two road-killed snakes were salvaged, and one fish was collected, for the collections of the North Carolina State Museum of Natural Sciences, and swabs were taken from a few amphibians and reptiles for a study on four emerging pathogens in amphibians and reptiles. Many observational records for various species were added to the Museum’s files and the NC Natural Heritage Program’s database. We dedicate this Wildathon to our teammate John Finnegan, who is battling cancer; to the late Dave Lenat, who recently lost his fight with it; and to all wild, free things everywhere. We wish to thank everyone who pledged our team this year. At this point, our pledged sponsors include Sunny and Lee Allen, Rudy Arndt, Jeff Beane, Erla Beegle, Ann Bilobrowka, Colleen Bockhahn, Hal Broadfoot, Alan Cameron, Sue Cameron, Angelo Capparella, Ed Corey, Bob Davis and Judy Morgan-Davis, Kelly Davis, Angie and Bill DeLozier, Janet Edgerton, John Finnegan and Stephanie Horton, Lena Gallitano, Jim Green, Luke and Shannon Groff, Jeff Hall, Diane Hardy, Andy Harrison, Julie Horvath, Ted Kahn, Matina Kalcounis-Rueppell, Roland Kays, Susan Kelemen, Sam Kennedy, Jane and Craig Lawrence, Tony Leiro, Greg Lewbart and Diane Deresienski, Lloyd Lewis, Gerry Luginbuhl, Jeff Marcus, Bob Oberfelder, Justin Oguni, Linda Rudd, Annie Runyon, Melody Scott, Megan Serr, Olivia and Jill Slack, Kim Smart, Dorothy Stowe, Leslie and John Watschke, Jan Weems, Kari Wouk, Steve Zimmerman, and almost certainly some others we may have inadvertently left out. Special thanks to Nate Shepard for help with trapping, to Ed Corey for the use of his vehicle, and to Jeff Beane and Bob Davis for providing their houses as bases of operation and lodging for the very tired. All monies raised will be used to support the same projects as previous years (Audubon’s Coastal Island Sanctuaries, local Wake Audubon projects, Project Bog Turtle, and Project Simus). Your generous support is greatly appreciated! You are the reason we keep doing it every year. It’s not too late to make a donation! If you haven’t already done so, please send your pledges to the address below (or give them to any of our team members or to Wake Audubon Treasurer John Gerwin) as soon as possible. Make checks payable to “Wake Audubon” (or “NC Herpetological Society” if you want to donate only to those projects). You can also use the PayPal option on Wake Audubon’s website (under “donate” on the home page), but please indicate that your donation is for the Wildathon, and let us know that you’ve paid via that option. Please contact one of us if you have any other questions. ￼￼Tuesday, 7:42 p.m. A Little Blue Heron rookery at Lake Waccamaw. Tuesday, 7:42 p.m. A Little Blue Heron rookery at Lake Waccamaw. Tuesday, 8:55 p.m. A Mud Snake near Lake Waccamaw kicks off the long night. After finding three of these beautiful semiaquatic serpents road-killed, we were pleased to see one alive. Wednesday, 4:08 a.m. Minnow traps yielded a Two-toed Amphiuma. This unique, eel-like salamander is North America’s longest amphibian and supposedly has the largest red blood cells of any animal. Wednesday, 7:29 a.m. We saw many Killdeer during this year’s Wildathon. We could only hope our resolve during the final hour was as strong as that of this tenacious female protecting her eggs. ￼￼Wednesday, 3:02 a.m. Sneaking up on nightjars is a fun way to stay awake in the wee hours. Much more often heard than seen, Chuck-Will’s-Widows have shown up on all of our Wildathons to date. Wednesday, 3:02 a.m. Sneaking up on nightjars is a fun way to stay awake in the wee hours. Much more often heard than seen, Chuck-Will’s-Widows have shown up on all of our Wildathons to date. ￼￼Wednesday, 7:20 a.m. Less than an hour remaining; exhaustedly scrambling for a few more species. Luckily, we knew where to find Tree Swallows. Wednesday, 7:20 a.m. Less than an hour remaining; exhaustedly scrambling for a few more species. Luckily, we knew where to find Tree Swallows. Friday, May 22, after a morning of banding birds, Eddie Owens and I were getting ready to hop in our cars when he pointed to a small group of swifts circling above the Chimney Swift Roost Tower at Prairie Ridge Ecostation in west Raleigh. As we watched, one of the birds took a quick turn and disappeared down the mouth of the chimney. We were thrilled to confirm reports from others that swifts had discovered our tower. But this wasn’t the first bit of good news Wake Audubon had received about swifts this spring. Earlier in May, I watched four chimney swifts circle over an information kiosk at Anderson Point Park in east Raleigh. The swifts were noisy and clearly eyeing the structure. Of course this wasn’t just any old information kiosk; it was one Wake Audubon had commissioned several years ago to be built by an Eagle Scout, and it had a swift nesting chimney installed as its center. Soon the birds circled higher, and I was able to watch a swift fly through the top of a tall maple to grab dead twigs. They returned to the kiosk. One of the swirling swifts raised its wings high, slowed down, and descended into the chimney’s center. It was the first confirmation that swifts are using the kiosk for nesting! All of this began with Wake Audubon’s ambitious undertaking to install the Chimney Swift Roost Tower at Prairie Ridge Ecostation, a field research and education center for the NC Museum of Natural Sciences. We spent three years planning and raising funds for the $36,000 project. More than 150 of you bought inscribed bricks. 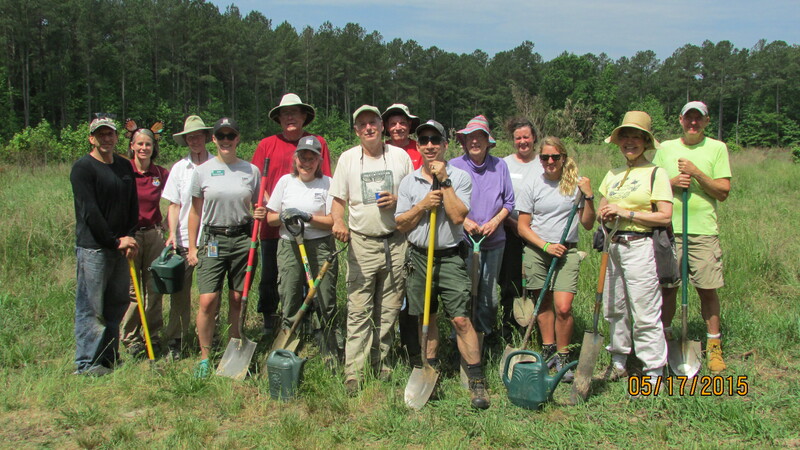 We secured donations from the Carolina Bird Club and the estate of Vicki Weiss, as well as grants from the Toyota TogetherGreen by Audubon program. Frank Harmon Associates donated design services and Custom Brick & Supply of Raleigh donated the bricks. Installation of the tower was completed in November. The tower is one of just a few large brick chimneys that have been built specifically for roosting swifts in the eastern U.S. We think it is, in fact, one of only three. Our tower is large: 30 feet tall with a 5-foot by 5-foot opening, designed to accommodate thousands of roosting swifts. There are portholes for looking inside the tower and for installing cameras and scientific equipment. We are hopeful, but there are no guarantees with these things. Of course we did our homework, which meant contacting Paul and Georgeann Kyle in Austin, Texas, who established a chimney swift research center in Austin and spearheaded the chimneyswifts.org website. They have years of experience experimenting with the design of swift nesting structures, including the practical swift nesting information kiosk that proved successful at Anderson Point Park. And they have had some success with small roosts. With the tower completed, our attention turns to celebrating it with you, together with experts from across North America who have tirelessly worked to conserve this species of concern. In March, Wake Audubon received a Toyota TogetherGreen Alumni Award to host a chimney swift conservation forum and workshop. When we began thinking about hosting a forum, our first invitation was sent to the Kyles, who agreed to be our featured speakers and will give an overview of their decades spent working with swifts. But there will be more, much more. Researchers from UNC Chapel Hill will offer a three-dimensional look at the flight patterns of swift flocks filmed flying above downtown Raleigh; Amy Weidensaul and Brian Shema from Audubon Pennsylvania will discuss educational programming at swift roosts; Charles Collins, a retired biologist from California, will compare swifts from around the world, and Larry Schwitter will describe Vaux’s Happenings in Washington state. Audubon NC plans to highlight chimney swifts across the state next year. Join us Friday evening, August 21, at the NC Museum of Natural Sciences for the symposium. On Saturday, August 22, Wake Audubon will partner with the museum to host the Chimney Swift Family Festival at Prairie Ridge Ecostation — our official celebration of the completion of the Chimney Swift Roost Tower. This will be a family-friendly event starting mid-afternoon. The festivities will include games for all ages, such as a roost-hole corn-hole contest, swift nest and mask making, and catch-a penny stealer bug chase games. (Intrigued? We know you are!) We will also have educational tables, arts and crafts, food trucks, music, guided hikes, and a roost viewing as the sun sets. Sunday at dusk, join us for swift roost viewings at other county sites. Details on these events will be posted here, on our Celebrate Swifts page. All are free admission. We can use volunteer help at Family Festival. Please contact us at volunteer@wakeaudubon.org if you are able to help. And please plan to attend the Friday chimney swift forum the Saturday family festival and the Sunday swift viewing the weekend of August 21-23.